The thirtieth American Towing Tank Conference (30th ATTC) will be held at the Naval Surface Warfare Center located at West Bethesda, Maryland, on the dates of 3 to 5 October 2017. The Conference objective is to promote exchange of knowledge and stimulate research for the purpose of improving methods of model and full-scale experiments and numerical modeling for predicting full-scale performance of ships and marine installations. To accomplish this, scholarly papers on the design of facilities, equipment, instrumentation, experimental techniques, uncertainty assessment, correlation of testing, verification, validation, and application of methods of predicting full-scale performance, and formulating collective policy on matters of common interest will be presented. The Conference begins with registration and a reception on the afternoon of 3 October 2017. This will be followed by two days of presentations of peer-reviewed papers. Conference registration includes a lunch on both the 4th and 5th and a dinner on the evening of the 4th. The American Towing Tank Conference is an old institution in Naval Architecture dating back to the 1930’s. A brief portrait of its founding and history to date is presented here to help introduce to the newcomer its place in the discipline of Naval Architecture, Marine and Ocean Engineering. The distance required to attend the International Towing Tank Conference (ITTC) in 1933 was impractical to allow any significant attendance or attendance at all. Dr. Kenneth Davidson (Stevens Institute of Technology) felt that “It is believed that the formation of an American association will allow a valuable exchange of ideas, problems, technique and standardization of certain detail practices among tank operators. In addition it is hoped to improve the value of tank results for the designer and ship operator in the estimate of power, relative performances and full-sized trial correlation.” Then, Commander Harold E. Saunders agreed, and, thus, the American Towing Tank Conference (ATTC) was founded in 1938. Twenty-nine (29) ATTC gatherings have occurred since the first in 1938. 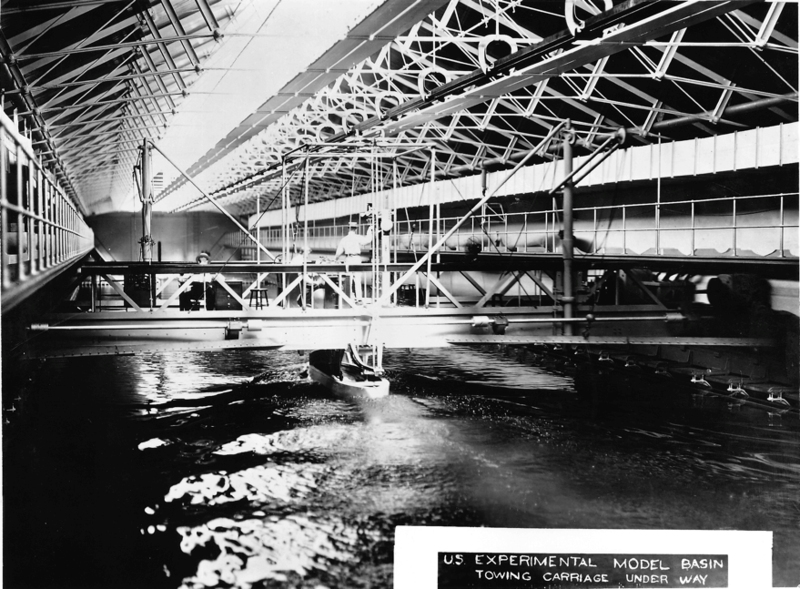 Captain Harold E. Saunders at the newly constructed David Taylor Model Basin hosted the second meeting. Attendance had grown to 15 with representatives from the David Taylor Model Basin (DTMB), The National Advisory Committee for Aeronautics (NACA), National Research Council (NRC), Newport News Ship Yard, Stevens Institute of Technology, University of Michigan, Massachusetts Institute of Technology and the National Bureau of Ships (NBS). Since these first two conferences, 27 others have met with the 30th to be held in 2017 and will be the fifth time that the David Taylor Model Basin, now Naval Surface Warfare Center Carderock Division will host it. The ATTC and ITTC had similar goals in the beginning, that is, to bring together naval architects, engineers and scientists to allow a valuable exchange of ideas, problems, technique and standardization of certain detail practices among tank operators. Over the years, both organizations have improved the value of tank results for the designer and ship operator in the estimate of power, relative performances and full-sized trial correlation. Over time, the bodies have adapted not only to changing technologies, but emerging technologies such as environmental protection and energy conversion and the use of various forms of numerical hydrodynamics. Currently, the ITTC has the lead role in the determination of standards and practices per ISO guidelines. This has left the ATTC with needing another purpose. Since the ITTC now has the duty of setting standards and conventions, it no longer produces seminal papers on methods and techniques. The ATTC can now fill this void and be the originator of new techniques in naval experimentation, numerical hydrodynamics and marine vehicle design. The ATTC will create the new methods that can be reviewed and adopted as the standard of the future by the ITTC. By the Rules of the American Towing Tank Conference, the objective of the ATTC is to promote exchange of knowledge and stimulate research for the purpose of improving methods of model-and full-scale experiments and numerical modeling for predicting full-scale performance of ships and marine installations. This includes the design of facilities, equipment, instrumentation, experimental techniques, uncertainty assessment, correlation of testing, verification, validation, and application of methods of predicting full-scale performance, and formulating collective policy on matters of common interest. The American Towing Tank Conference will lead the way to the future for the design, evaluation, and testing of marine vehicles, ships, submarines, ocean and environmental systems. The towing tank still has a significant purpose in performing experimental studies beyond our current numerical capabilities and base lining numerical predictions.